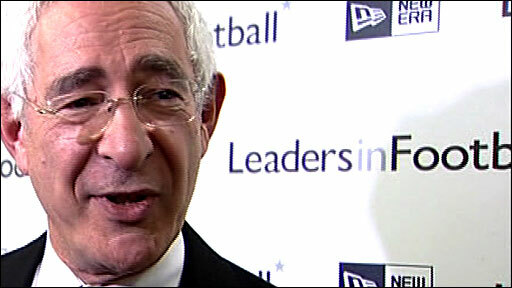 Football Association chairman Lord Triesman believes the global credit crisis could pose a "terrible danger" to clubs dealing with spiralling debts. Against the backdrop of such a volatile financial climate, Triesman estimates English clubs owe an estimated £3bn. He told BBC Sport: "They're beginning to see the edge of the hurricane - the art is to get out of the path of it." Premier League chief executive Richard Scudamore rejected Triesman's concerns, arguing clubs' debts were manageable. A worldwide banking crisis has led to a collapse in shares, fears of a recession and increasing costs for clubs having to repay or maintain huge debts - with Liverpool, Chelsea, Arsenal and Manchester United accounting for a third of that £3bn debt according to Triesman. However, Chelsea say their "unique ownership structure" means that monies owed are "internal and in the form of interest free loans from the owner that have no repayment time frame attached". At the weekend Liverpool chief executive Rick Parry admitted the club's planned £350m new stadium had been put on hold due to the current financial crisis, while West Ham are battling claims Iceland's second-biggest bank Landsbanki going into receivership will have a negative impact on the club. Wall Street investment bank Lehman Brothers is another high-profile casualty of the crisis and Triesman fears a major club could suffer a similar fate. "Did I have a genuine fear that Lehman Brothers would go bust?' I'd say, 'No I didn't'," said Triesman at the Leaders in Football conference at Stamford Bridge. "What I know is we are in a very much more volatile position in which debt is not only a problem in terms of its volume, it's a problem because those who own the debt are themselves now often in serious problems. Your fate isn't in your own hands. "I don't think anybody who is rational can look around this environment we are in and think they are immune. "Football is obviously carrying a pretty large volume of debt. People will be making business judgements about whether it is sustainable or not, but it is carrying quite a large volume of debt. "Those debts will either have to be paid or there will have to be a re-financing deal, and re-financing deals inevitably mean that you package up debt in smaller blocks as people try to minimise the risk. "What we do know about loads of events in the credit crunch is that it becomes harder and harder to track who owns the debt or these packages of debt and how secure they are. "We now have a position where it is very hard to track things. It is not transparent enough and we don't know, if we are able to track it, if the debt is held by people who are financially secure or not. "And if all of these things go wrong I suppose it is not inconceivable that a great club, or a very small club, will come under pressures it has not seen before." How big a problem is debt in football? Speaking later at the conference, Scudamore defended clubs' debt levels and took a swipe at the FA's own financial affairs. "What's important is the level of indebtedness is proportionate to your income," said Scudamore. "The last figures I saw was that indebtedness in professional football in his country was running at about £2.5-£2.6bn, which is about where current annual revenues are in football. So our ratio is about 1:1. "The FA themselves know about all these things because they are one of the most indebted organisations in the world. Their Wembley debt is about £350m and they have a turnover of about £300m. "Our clubs are all heavily regulated but they've also got directors and owners who will assess the level of risk of their overall debt. This is at the top of clubs agendas and I think they are managing it responsibly. "The 92 names today are very similar to the 92 names of yesterday. They are very sustainable brands and that's the most important thing."